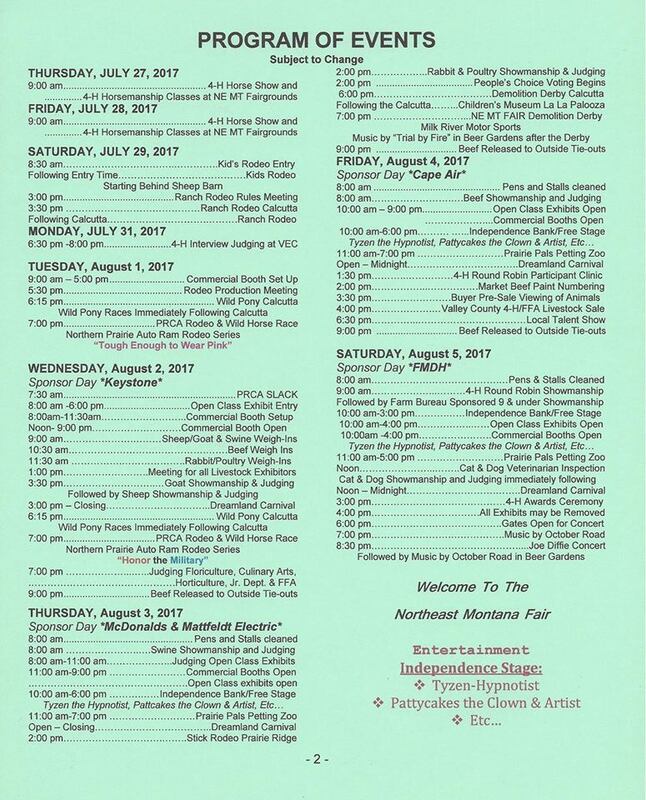 Our Northeast Montana Fair page - check back for more details closer to summer! Nashua native and longtime Scobey resident Lisa Garsjo Thievin will kick-off the 2018 NEW STARS IN THE WESTERN SKY TALENT SHOW with a pre-show beginning at 6:30 p.m., followed by the Talent Show at 7:00 p.m. - Friday August 3rd in front of the grandstands. The daughter of former north-Nashua farmers Hartvik and Agnes Garsjo, Lisa began performing as a young child; and during the late 70’s through early 80’s, was a contestant in several of the Valley County Fair Talent Shows, at which time were put on by members of the local WIFE organization. After moving to Scobey, Lisa and her husband Willie had their own band during the 1990’s – playing mostly country music for dances all around this northeastern corner of the state. With the use of Dave and Marie Pippin’s sound equipment, Lisa will take you on a trip down memory lane with some of the songs she has performed over the years. Lisa is excited to be part of the NEW STARS IN THE WESTERN SKY TALENT SHOW. Proceeds are used to fund a scholarship program for Valley County college students enrolled with majors or minors in Music & the Arts. The Northeast Montana Fair begins with the 4-H Horse Show & Horsemanship Classes at 9a.m. both Thurs. & Fri. July 26th & 27th. Saturday is the Kid’s Rodeo at 8:30a.m. & the Ranch Rodeo at 5p.m. Monday the 30th is the 4-H Interview Judging at the Event Center. Tuesday is the Wild Pony Calcutta at 6:15p.m. followed by the Wild Pony Races & the Northern Prairie Auto Ram Rodeo Series PRCA Rodeo & Wild Horse Race & it is “Tough Enough to Wear Pink” night. Wednesday is the 2nd night for the Wild Pony Calcutta at 6:15p.m. followed by the Wild Pony Races & the Northern Prairie Auto Ram Rodeo Series PRCA Rodeo & Wild Horse Race & it is “Honor the Military & Law Enforcement” night. The Demolition Derby is Thurs. Aug. 2nd at 6p.m. with the Calcutta. The New Stars in the Western Skies Talent Show is Friday beginning at 6:30p.m. Saturday brings the Concert with October Road opening for John Michael Montgomery; gates open at 6p.m. Tickets for the John Michael Montgomery concert are available at the KLTZ/Mix93 Studios, The Cottonwood Inn & the Chamber Office. Cost is $35 in advance, $45 at the gate, with price breaks available for kids. The Dreamland Carnival opens Wed. Aug. 1st at 3p.m. & runs through Sat. Aug. 4th at midnight. Recording Artist Cale Moon-Rock,Paper,Scissor tourn. Recording Artist Cale Moon- Rock,Paper,Scissor tourn. Whether it’s open class, school-related, 4H or FFA, exhibits are an important part of the Northeast Montana Fair. If you have an entry to submit, you can pick up the forms at the Fair Office on the Fairgrounds or at the Extension Office at the Valley County Courthouse. Pre-entry is encouraged any time prior to entry day. The sooner, the better. No entry blanks will be accepted after 6 p.m. on Wednesday, July 27th. Entry Open Until Sunday, August 2nd-6:00 P.M.
7:00 pm........................................ PRCA Rodeo & Wild Horse Race Northern Prairie Auto RAM Rodeo Series "Tough Enough to Wear Pink"
Entry Open Until Sunday, August 2nd- 6:00 P.M.
7:00 pm......................................... PRCA Rodeo & Wild Horse Race Northern Prairie Auto RAM Rodeo Series "Honor the Military"